This very rare sterling-silver filigree necklace features the lucky Indalo, recognized in Andalucía, southern Spain, as a symbol of protection and good fortune. Even today, small village pueblos lie hidden behind the giant sierras that roll down to the Mediterranean shores and the Indalo is known for its good luck qualities. 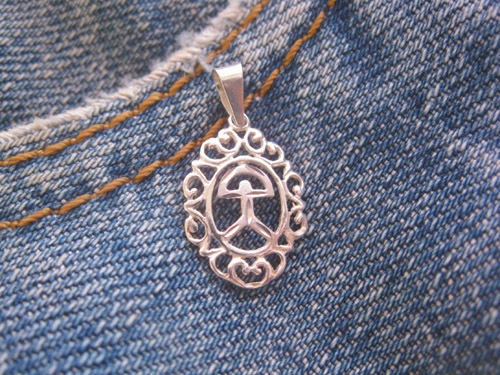 Dimensions: This pretty engraved Indalo pendant measures 23mm long including the hanging bail and 12mm wide. It hangs on an 18" sterling silver trace chain. 20" option also available: Please choose in options box. Everyone needs a guiding spirit to help them through life's challenges. Let this lucky silver Indalo be it. Comes gift-wrapped, like all our presents (with an information card about the Indalo) - and we can print a personal message on your behalf.